So far we’ve studied only translational motion: objects sliding, falling, or rising, but in none of our examples have we considered spinning objects. We will now look at rotation, which will complete our study of motion. 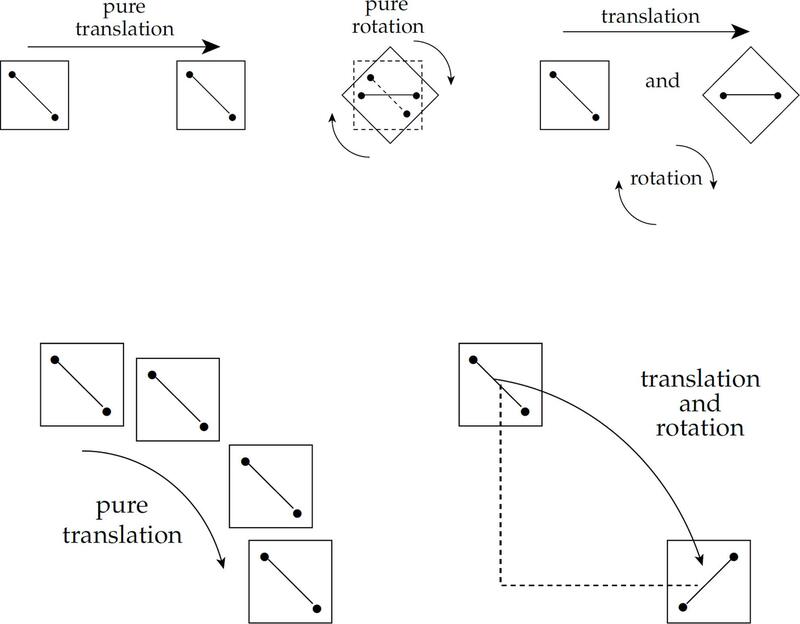 All motion is some combination of translation and rotation, which are illustrated in the figures below. 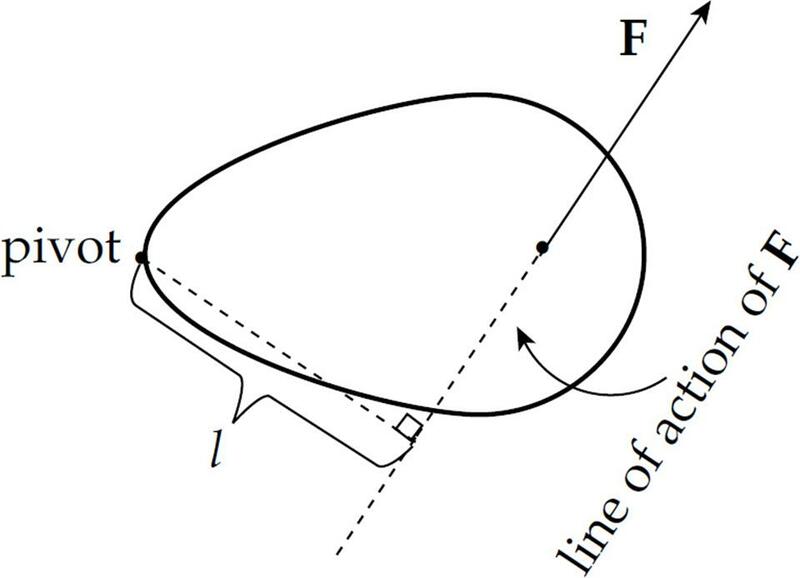 Consider any two points in the object under study (on the left) and imagine connecting them by a straight line. If this line does not turn while the object moves, then the object is translating only. However, if this line does not always remain parallel to itself while the object moves, then the object is rotating. 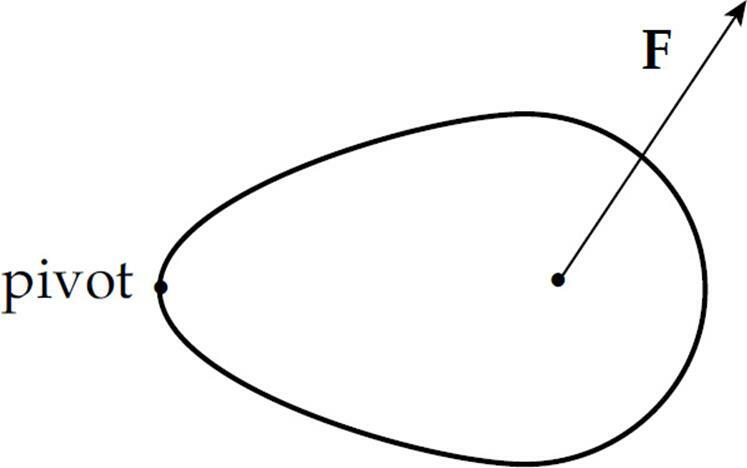 Mark several dots along a radius on a disk, and call this radius the reference line. If the disk rotates about its center, we can use the movement of these dots to talk about angular displacement, angular velocity, and angular acceleration. If the disk rotates as a rigid body, then all three dots shown have the same angular displacement, θ. In fact, this is the definition of a rigid body: All points along a radial line always have the same angular displacement. 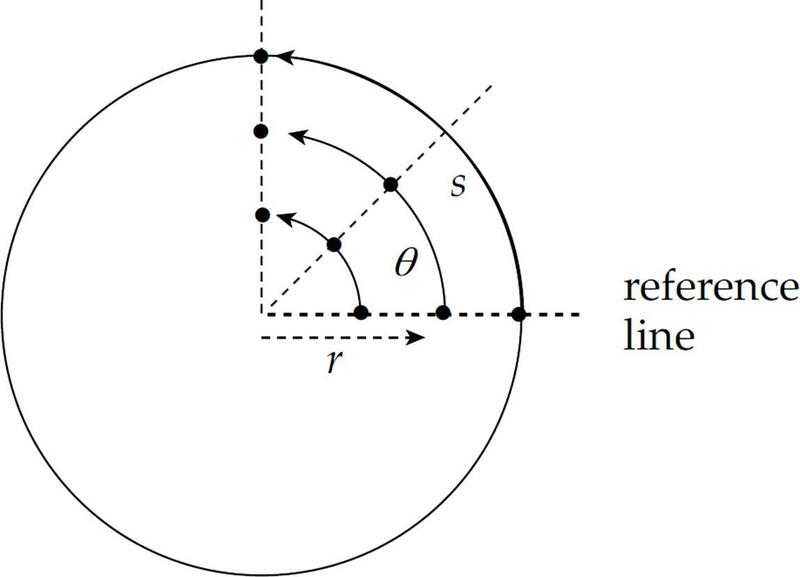 Therefore, the greater the value of r, the greater the value of v. Points on the rotating body farther from the rotation axis move more quickly than those closer to the rotation axis. (It’s important to realize that the acceleration a in this equation is not centripetal acceleration; it’s tangential acceleration, which arises from a change in speed caused by an angular acceleration. By contrast, centripetal acceleration does not produce a change in speed.) Often, tangential acceleration is written as at to distinguish it from centripetal acceleration (ac). Example 1 A rotating, rigid body makes one complete revolution in 2 s. What is its average angular velocity? Example 2 The angular velocity of a rotating disk increases from 2 rad/s to 5 rad/s in 0.5 s. What’s the disk’s average angular acceleration? Example 3 A disk of radius 20 cm rotates at a constant angular velocity of 6 rad/s. How fast does a point on the rim of this disk travel (in m/s)? Note that although we typically write the abbreviation rad when writing angular measurements, the radian is actually a dimensionless quantity, since, by definition, θ = s/r. So θ = 6 means the same thing as θ = 6 rad. 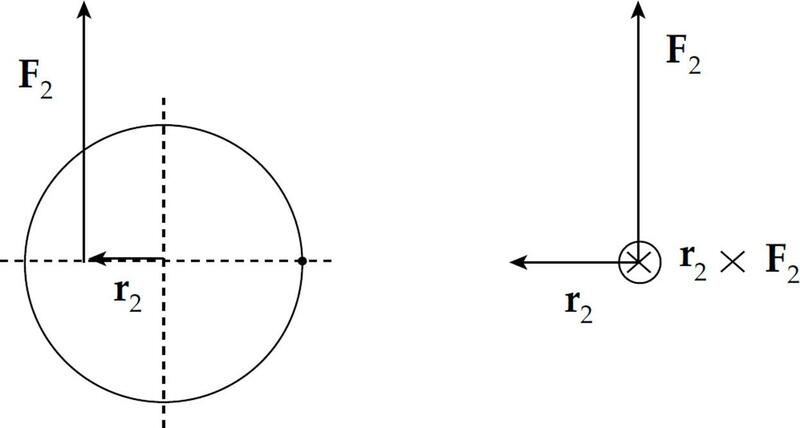 Example 4 The angular velocity of a rotating disk of radius 50 cm increases from 2 rad/s to 5 rad/s in 0.5 s. What is the linear tangential acceleration of a point on the rim of the disk during this time interval? Example 5 Derive an expression for centripetal acceleration in terms of angular speed. The simplest type of rotational motion to analyze is motion in which the angular acceleration is constant (possibly equal to zero). Another restriction that will make our analysis easier (and which doesn’t diminish the power and applicability of our results too much) is to consider rotational motion around a fixed axis of rotation. In this case, there are only two possible directions for motion. One direction, counterclockwise, is called positive (+), and the opposite direction, clockwise, is called negative (–). Let’s review the quantities we’ve seen so far. The fundamental quantities for rotational motion are angular displacement ( θ), angular velocity (ω), and angular acceleration (α). Because we’re dealing with angular acceleration, we know about changes in angular velocity, from initial velocity (ωi or ω0) to final velocity (ωf or simply ω—with no subscript). And, finally, the motion takes place during some elapsed time interval, t. Therefore, we have five kinematics quantities: θ, ω0, ω, α, and t.
These five quantities are interrelated by a group of five equations which we call the Big Five. They work in cases in which the angular acceleration is uniform. 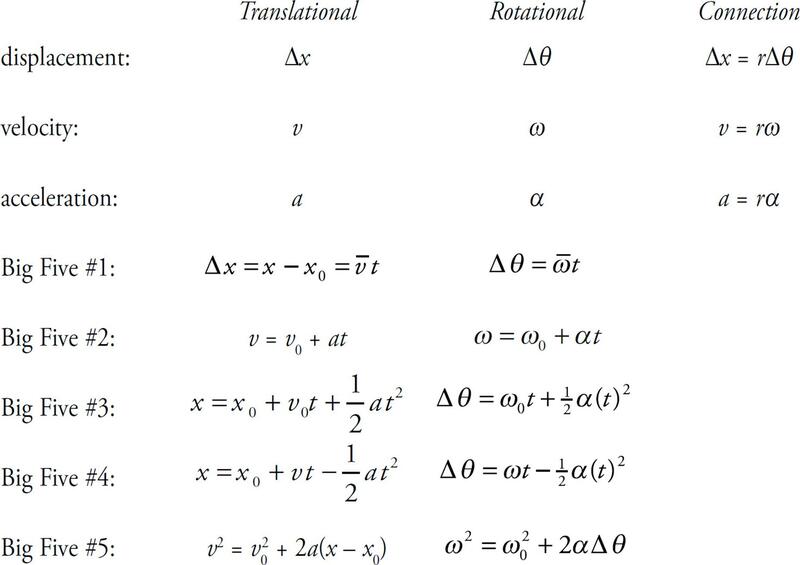 These equations are identical to the Big Five we studied in Chapter 4 but, in these cases, the translational variables (s, v, or a) are replaced by the corresponding rotational variables (θ, ω, or α, respectively). 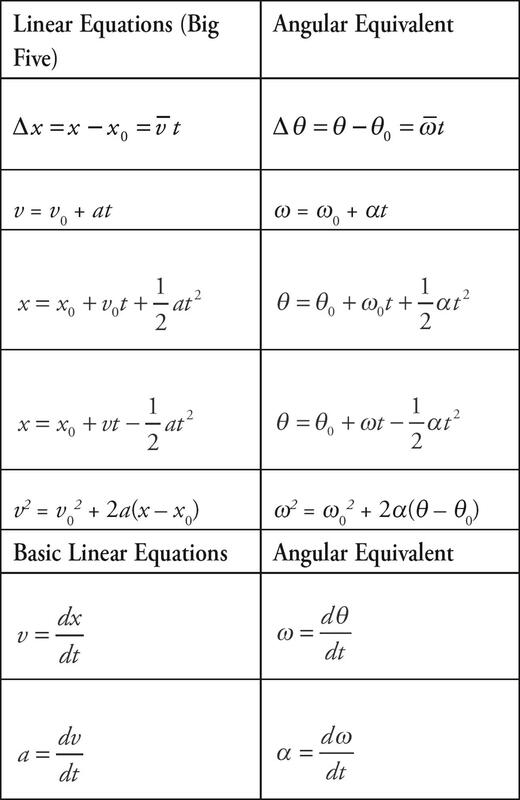 In Big Five #1, because angular acceleration is constant, the average angular velocity is simply the average of the initial angular velocity and the final angular velocity: . Also, if we decide that ti = 0, then t = tf – ti = t – 0 = t, so we can just write “t” instead of “ t” in the first four equations. 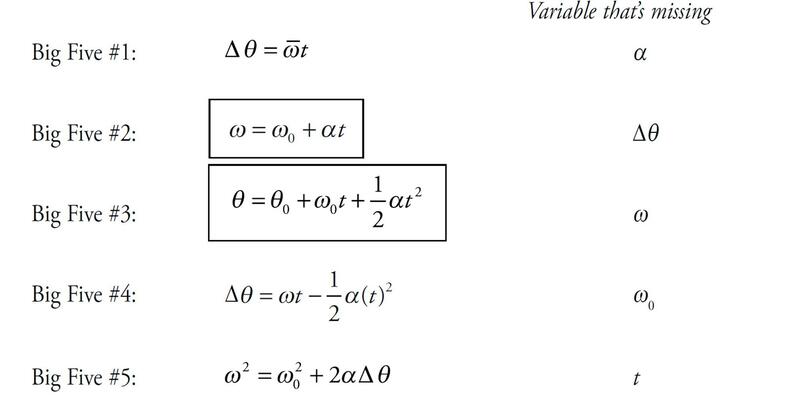 This simplification in notation makes the equations a little easier to memorize. Each of the Big Five equations is missing exactly one of the five kinematics quantities and, as with the other Big Five you learned, the way you decide which equation to use is to determine which of the kinematics quantities is missing from the problem, and use the equation that’s also missing that quantity. For example, if the problem never mentions the final angular velocity—ω is neither given nor asked for—then the equation that will work is the one that’s missing ω; that’s Big Five #3. Notice that Big Five #1 and #2 are simply the definitions of and written in forms that don’t involve fractions. Example 6 An object with an initial angular velocity of 1 rad/s rotates with constant angular acceleration. Three seconds later, its angular velocity is 5 rad/s. Calculate its angular displacement during this time interval. Example 7 Starting with zero initial angular velocity, a sphere begins to spin with constant angular acceleration about an axis through its center, achieving an angular velocity of 10 rad/s when its angular displacement is 20 rad. What is the value of the sphere’s angular acceleration? The dynamics of translational motion involve describing the acceleration of an object in terms of its mass (inertia) and the forces that act on it; Fnet = ma. By analogy, the dynamics of rotational motion involve describing the angular (rotational) acceleration of an object in terms of itsrotational inertia and the torques that act on it. Intuitively, torque describes the effectiveness of a force in producing rotational acceleration. 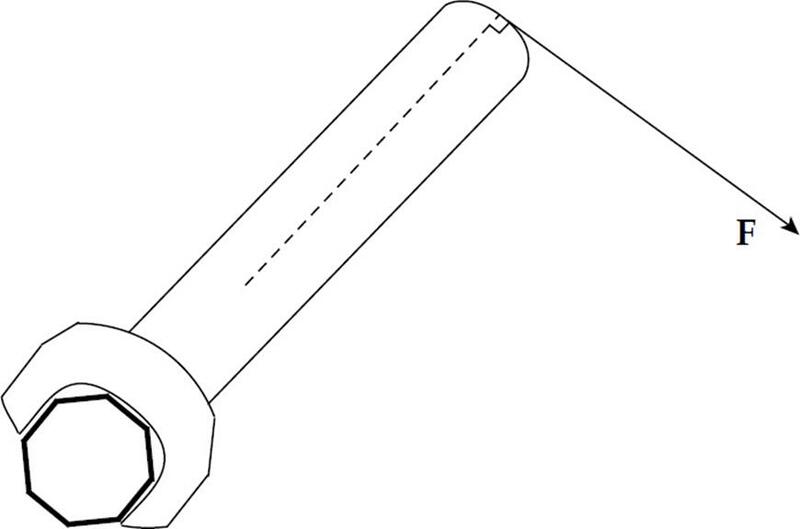 Consider a uniform rod that pivots around one of its ends, which is fixed. For simplicity, let’s assume that the rod is at rest. 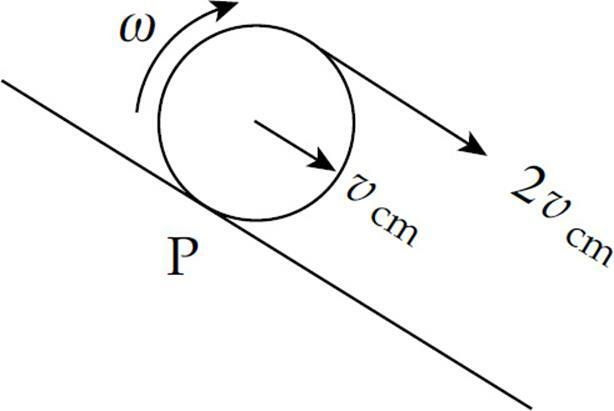 What effect, if any, would each of the four forces in the figure below have on the potential rotation of the rod? Our intuition tells us that F1, F2, and F3 would not cause the rod to rotate, but F4 would. What’s different about F4? It has torque. Clearly, torque has something to do with rotation. Just like a force is a vector quantity that produces linear acceleration, a torque is a vector quantity that produces angular acceleration. Note that, just like for linear acceleration, an angular acceleration is something that either changes the direction of the angular velocity or changes the angular speed. A torque can be thought of as being positive if it produces counterclockwise rotation, or negative if it produces clockwise rotation. The torque of a force can be defined as follows. 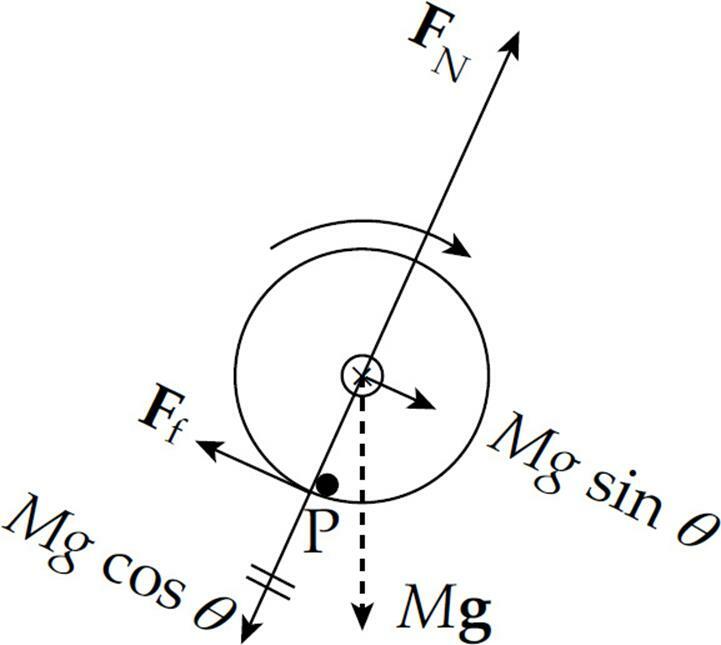 Let r be the distance from the pivot (axis of rotation) to the point of application of the force F, and let θ be the angle between vectors r and F.
In the figure above, the angle between the vectors r and F is θ. 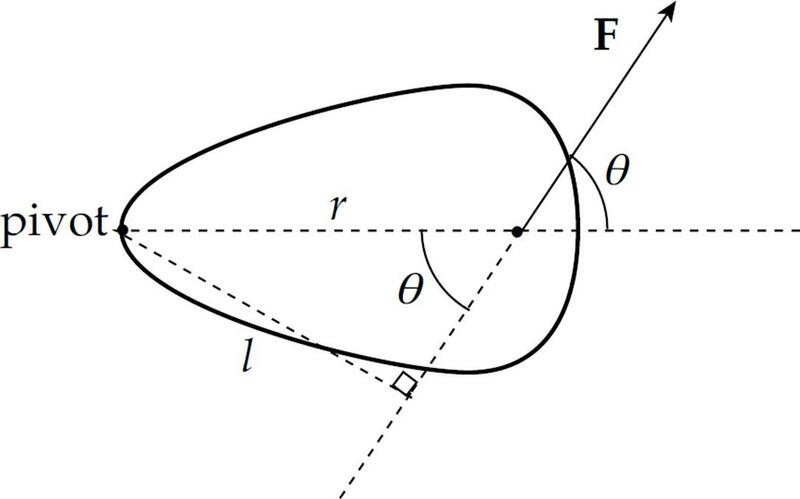 Imagine sliding r over so that its initial point is the same as that of F. The angle between two vectors is the angle between them when they start at the same point. However, the supplementary angle θ’ can be used in place of θin the definition of torque. This is because torque depends on sin θ, and the sine of an angle and the sine of its supplement are always equal. Therefore, when figuring out torque, use whichever of these angles is more convenient. 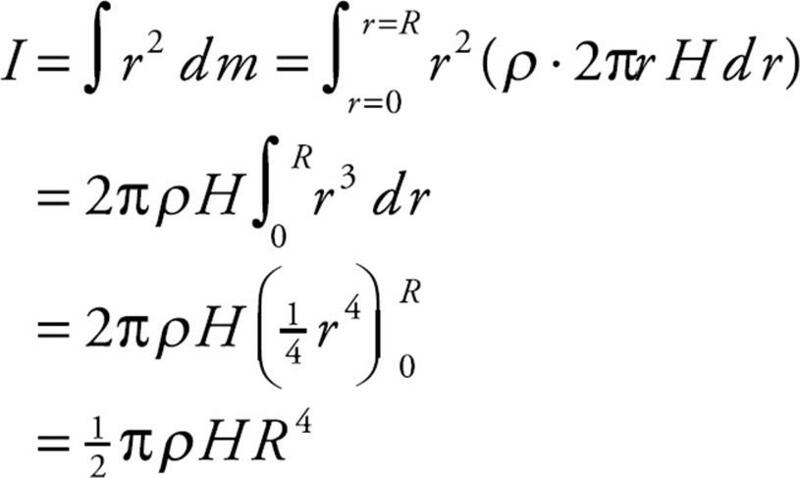 We will now see if this mathematical definition of torque supports our intuition about forces F1, F2, F3, and F4. 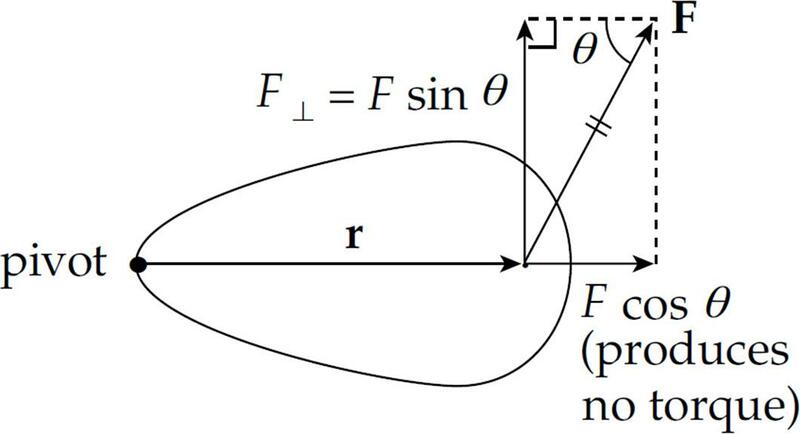 The angle between r and F1 is 0, and θ = 0 implies sin θ = 0, so by the definition of torque, τ = 0 as well. The angle between r and F2 is 180°, and θ = 180° gives us sin θ = 0, so τ = 0. For F3, r = 0 (because F3 acts at the pivot, so the distance from the pivot to the point of application of F3is zero); since r = 0, the torque is 0 as well. However, for F4, neither r nor sin θ is zero, so F4 has a nonzero torque. 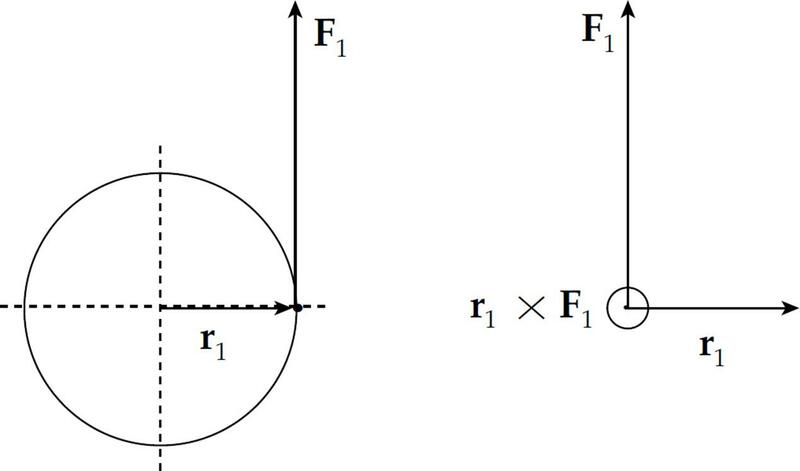 Of the four forces shown in that figure, only F4 has torque and would produce rotational acceleration. Instead of determining the distance from the pivot point to the point of application of the force, we will now determine the (perpendicular) distance from the pivot point to what’s called the line of action of the force. This distance is the lever arm (or moment arm) of the force F relative to the pivot, and is denoted by l.
Since l is the component of r that’s perpendicular to F, it is also denoted by r⊥ (“r perp”). So the definition of torque can be written as τ = r⊥F. So the definition of torque can also be written as τ = rF⊥. 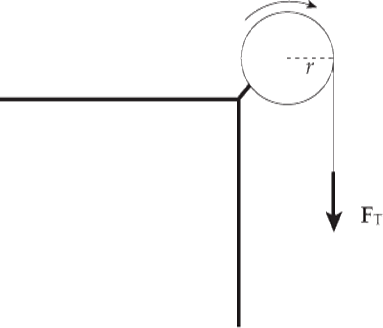 Example 8 A student pulls down with a force of 40 N on a rope that winds around a pulley of radius 5 cm. What’s the torque of this force? 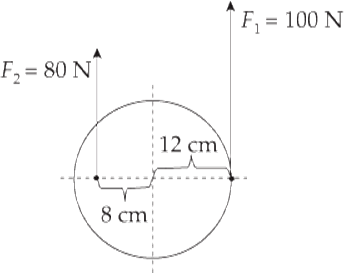 Example 9 What is the net torque on the cylinder shown below? 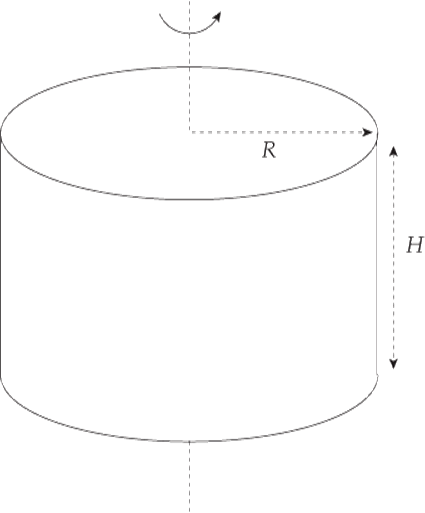 The cylinder is pinned at its center. These symbols are easy to remember if you think of a dart: is the point of the dart coming at you and is the pattern of feathers at the back of the dart you see as it flies away from you toward the dartboard. If the torque vector points out of the plane of the page, this indicates a tendency to produce counterclockwise rotation and, if it points into the plane of the page, this indicates a tendency to produce clockwise rotation. Our goal is to develop a rotational analog of Newton’s Second Law, Fnet = ma. We’re almost there; torque is the rotational analog of force and, therefore, τnet is the rotational analog of Fnet. 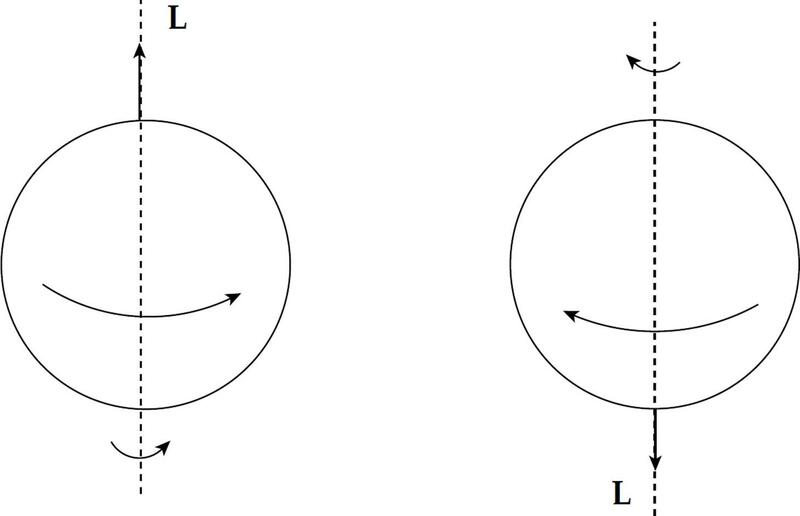 The rotational analog of translational acceleration, a, is rotational (or angular) acceleration, α. We will now look at the rotational analog of inertial mass, m.
Consider a small point mass m at a distance r from the axis of rotation, being acted upon by a tangential force F.
In the equation F = ma, the quantity m is multiplied by the acceleration produced by the force F, while in the equation τ = mr2α, the quantity mr2 is multiplied by the rotational acceleration produced by the torque τ. Example 10 Three beads, each of mass m, are arranged along a rod of negligible mass and length L. Figure out the rotational inertia of the assembly when the axis of rotation is through the center bead and when the axis of rotation is through one of the beads on the ends. Note that, although both assemblies have the same mass (namely, 3m), their rotational inertias are different, because of the different distribution of mass relative to the axis of rotation. which agrees with the value calculated above. 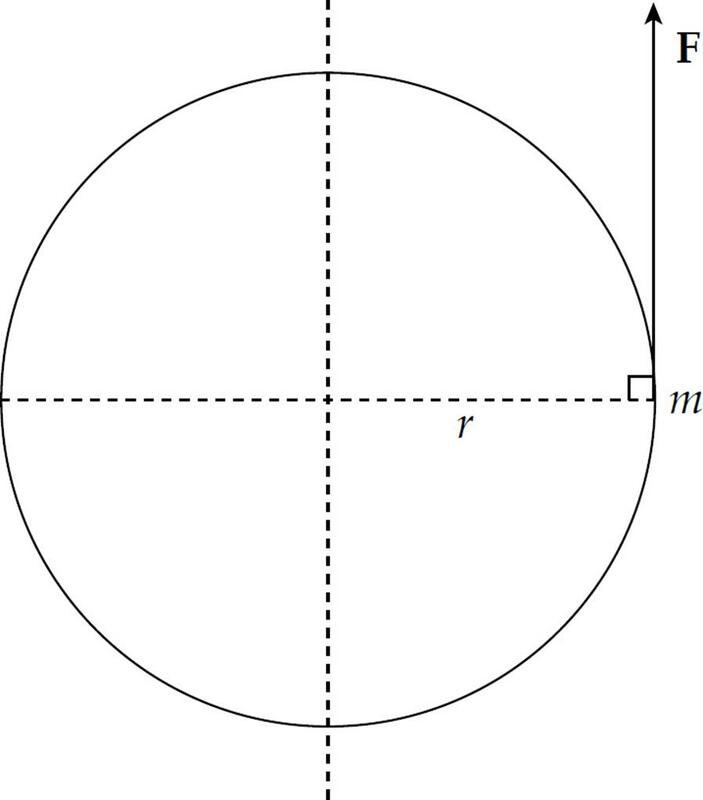 Example 11 Show that the rotational inertia of a homogeneous cylinder of radius R and mass M, rotating about its central axis, is given by the equation I = MR2. The height of the cylinder (the dimension parallel to the axis of rotation) is irrelevant. Therefore, the formula I = MR2 gives the rotational inertia of any homogeneous solid cylinder revolving around its central axis. This includes a disk (which is just a really short cylinder). Assume that the mass of the cylinder is 50 kg. Given that the rotational inertia of a cylinder of radius R and mass M rotating about its central axis is given by the equation I = MR2, determine the rotational acceleration produced by the two forces shown. This angular acceleration will be counterclockwise, because τnet is counterclockwise. Example 13 A block of mass m is hung from a pulley of radius R and mass M and allowed to fall. What is the acceleration of the block? Solution. Remember that earlier, we treated pulleys as if they were massless, and no force was required to make them rotate. Now, however, we know how to take the mass of a pulley into account, by including its rotational inertia in our analysis. 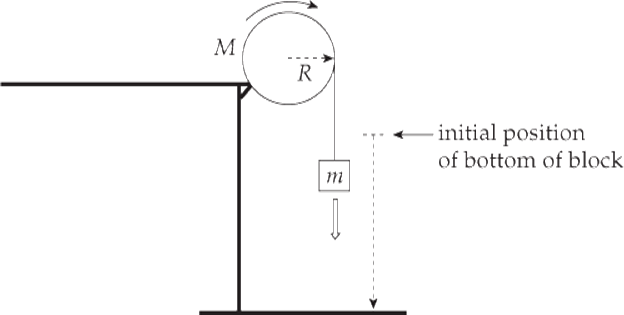 The pulley is a disk, so its rotational inertia is given by the formula I = MR2. A rotating object has rotational kinetic energy, just as a translating object has translational kinetic energy. 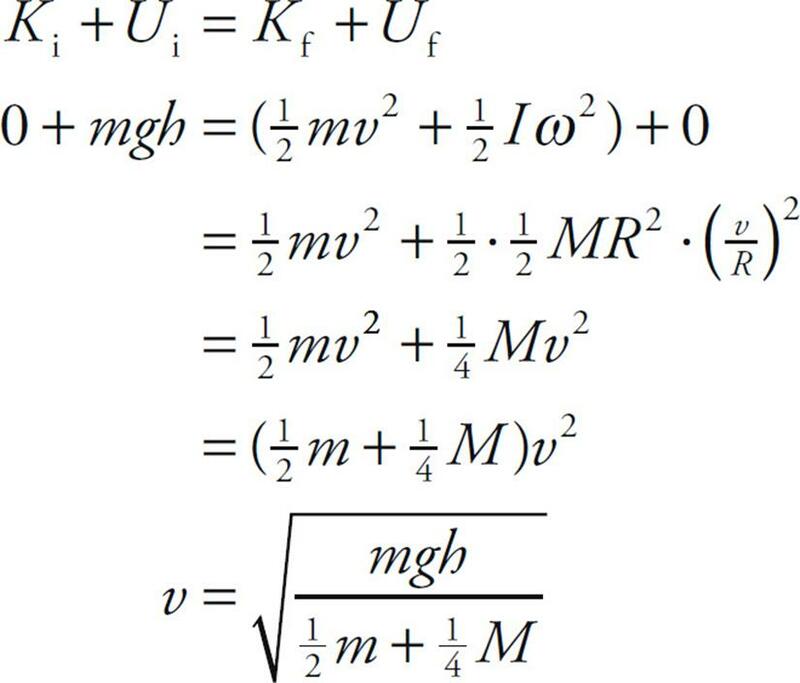 The formula for kinetic energy is, of course, K = mv2, but this can’t be directly used to calculate the kinetic energy of rotation because each point mass that makes up the body can have a different v. For this reason, we need a definition of Krotational that involves ω instead of v.
Note that this expression for rotational kinetic energy follows the general pattern displayed by our previous results: I is the rotational analog of m and ω is the rotational analog of v. Therefore, the rotational analog of mv2 should be Iω2. One of the main types of motion associated with rotational motion is rolling motion. We will primarily deal with rolling without slipping. Consider a disk rolling down an incline without slipping. The point of contact of the object with the surface P is instantaneously at rest. If this were not the case then the disk would be slipping down the incline, so the contact point must not be moving relative to the surface. In this case, the velocity of the center of mass of the disk is equal to the radius times the angular velocity of the disk. You can take the torque around any point to determine the acceleration of the disk. It is often easiest to take it around the contact point P because then only gravity provides a torque about this point, and if you know the mass of the object, then you know the force of gravity. Make sure to use the parallel-axis theorem in this case since you are considering the rotational inertia about point P, not the center of mass. This will allow you to calculate the acceleration of the disk. Once you know the acceleration, you can calculate the necessary coefficient of friction to produce rolling without slipping using Newton’s Second Law. 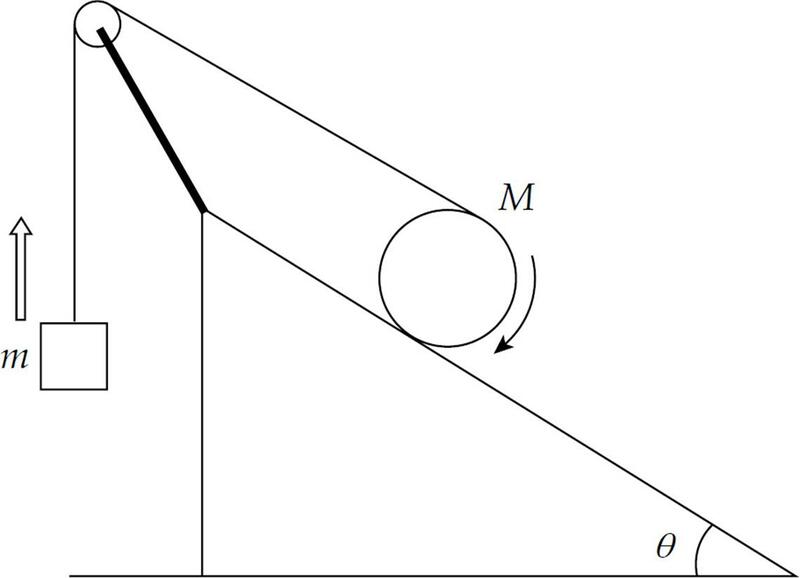 The total motion for an object that is rolling without slipping is the combined motion of the entire object translating with the velocity of the center of mass, and the object rotating about its center of mass, as shown below. This shows the object is instantaneously rotating about the contact point P.
For rolling motion the total kinetic energy is the translational kinetic energy and the rotational kinetic energy. Example 14 A cylinder of mass M and radius R rolls (without slipping) down an inclined plane whose incline angle with the horizontal is θ. Determine the acceleration of the cylinder’s center of mass, and the minimum coefficient of friction that will allow the cylinder to roll without slipping on this incline. We know that the cylinder rolls without slipping, so the force of friction is not kinetic friction. Since the speed of the point on the cylinder in contact with the ramp is zero with respect to the ramp, static friction supplies the torque that allows the cylinder to roll smoothly. Take the torque about the contact point to solve for the acceleration because the frictional force will not be part of the equation and we do not know it yet. Now we will use Newton’s Second Law to solve for µs since we know the acceleration. 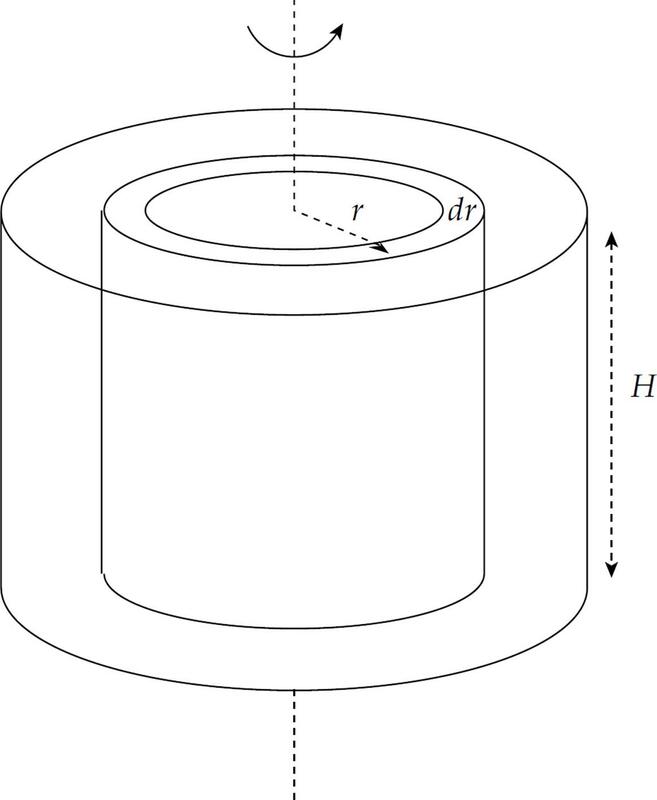 Example 15 A cylinder of mass M and radius R rolls (without slipping) down an inclined plane (of height h and length L) whose incline angle with the horizontal is θ. Determine the linear speed of the cylinder’s center of mass when it reaches the bottom of the incline (assuming that it started from rest at the top). Consider a small point mass m at distance r from the axis of rotation, acted upon by a tangential force F.
If the force is not purely tangential to the object’s path, then only the tangential component of the force does work; the radial component does not (since it’s perpendicular to the object’s displacement). Therefore, for a general constant force F, the equation above would read W = Ftr θ = τ θ, where Ft denotes the tangential component of F.
The work–energy theorem (W = K) also holds in the rotational case, where W is the work done by net torque and K is the resulting change in the rotational kinetic energy. Once again, notice the parallel to P = Fv, the translation version of this equation. 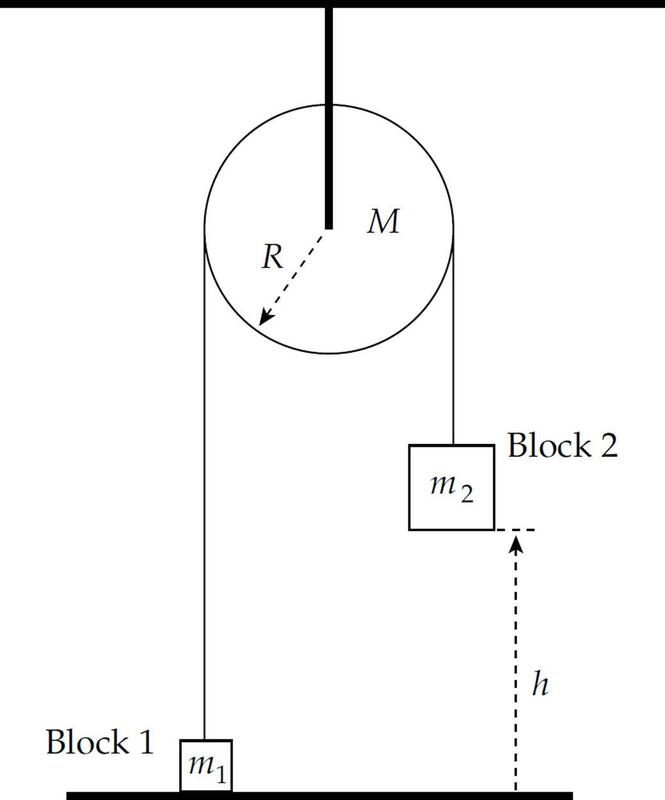 Example 16 A block of mass m = 5 kg is hung from a pulley of radius R = 15 cm and mass M = 8 kg and then released from rest. (a) What is the speed of the block as it strikes the floor, 2 m below its initial position? (b) What is the rotational kinetic energy of the pulley just before the block strikes the floor? (c) At what rate was work done on the pulley? So far we’ve developed rotational analogs for displacement, velocity, acceleration, force, mass, and kinetic energy. We will finish by developing a rotational analog for linear momentum; it’s called angular momentum. Consider a small point mass m at distance r from the axis of rotation, moving with velocity v and acted upon by a tangential force F.
Note that this expression for angular momentum follows the general pattern we saw previously: I is the rotational analog of m, and ω is the rotational analog of v. Therefore, the rotational analog of mv should be Iω. 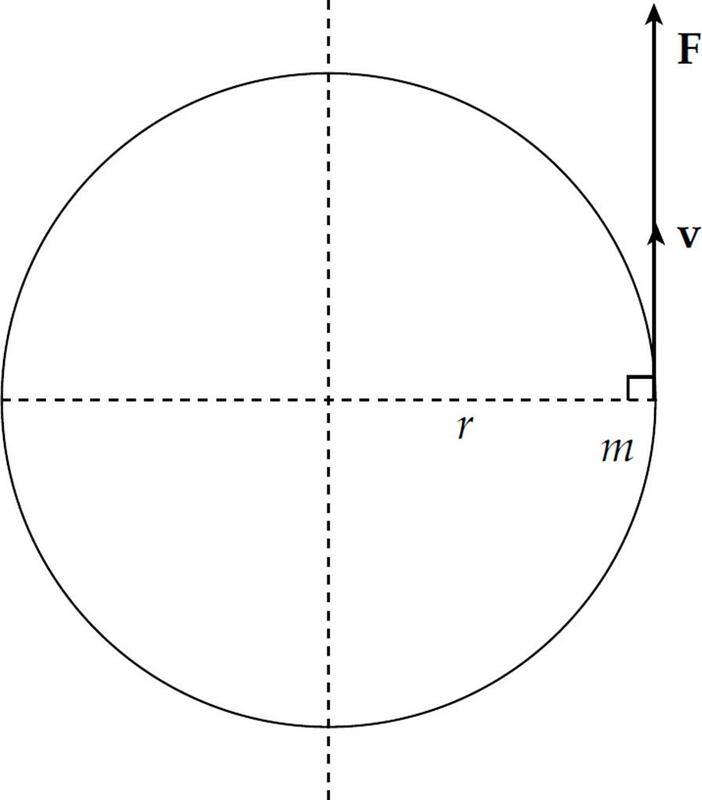 If the point mass m does not move in a circular path, we can still define its angular momentum relative to any reference point. 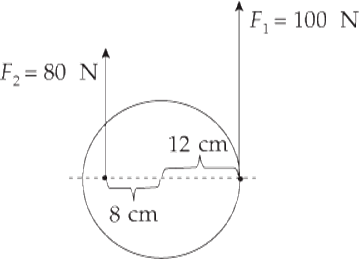 Example 17 A solid uniform sphere of mass M = 8 kg and radius R = 50 cm is revolving around an axis through its center at an angular speed of 10 rad/s. 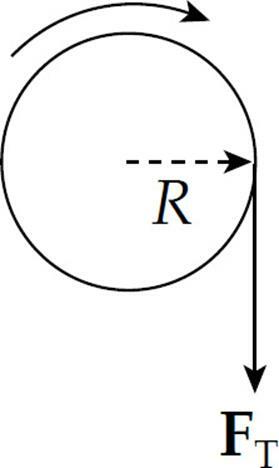 Given that the rotational inertia of the sphere is equal to MR2, what is the spinning sphere’s angular momentum? so if Fnet = 0, then p is constant. This is Conservation of Linear Momentum. So if τnet = 0, then L is constant. This is Conservation of Angular Momentum. Basically, this says that if the torques on a body balance so that the net torque is zero, then the body’s angular momentum can’t change. An often cited example of this phenomenon is the spinning of a figure skater. As she pulls her arms inward, she moves more of her mass closer to the rotation axis and decreases her rotational inertia. Since the external torque on her is negligible, her angular momentum must be conserved. Since L = Iω, a decrease in I causes an increase in ω, and she spins faster. 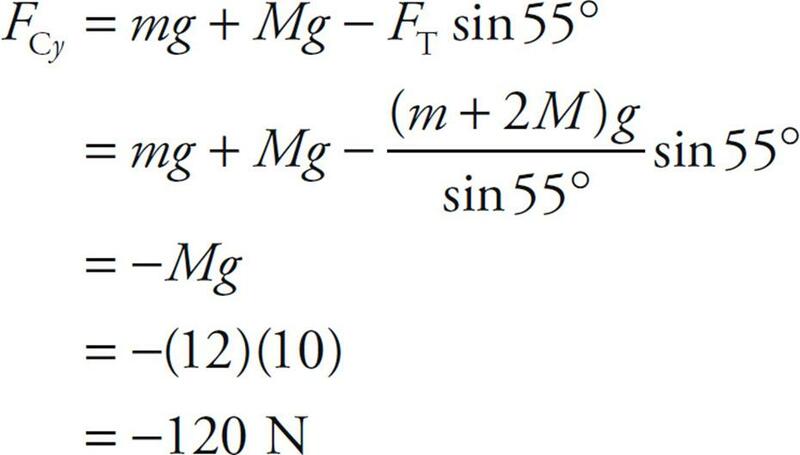 Example 18 A child of mass m = 30 kg stands at the edge of a small merry-go-round that’s rotating at a rate of 1 rad/s. 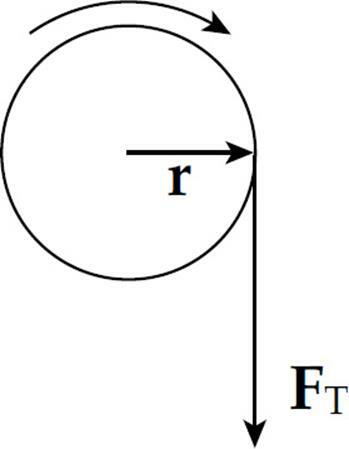 The merry-go-round is a disk of radius R = 2.5 m and mass M = 100 kg. If the child walks in toward the center of the disk and stops 0.5 m from the center, what will happen to the angular velocity of the merry-go-round (if friction can be ignored)? Notice that ω increased as I decreased, just as Conservation of Angular Momentum predicts. An object is said to be in translational equilibrium if the sum of the forces acting on it is zero; that is, if Fnet = 0. Similarly, an object is said to be in rotational equilibrium if the sum of the torques acting on it is zero; that is, if τnet = 0. The term equilibrium by itself means both translational and rotational equilibrium. A body in equilibrium may be in motion; Fnet = 0 does not mean that the velocity is zero; it only means that the velocity is constant. Similarly, τnet = 0 does not mean that the angular velocity is zero; it only means that it’s constant. If an object is at rest, then it is said to be in static equilibrium. Example 19 A uniform bar of mass m and length L extends horizontally from a wall. A supporting wire connects the wall to the bar’s midpoint, making an angle of 55° with the bar. A sign of mass M hangs from the end of the bar. 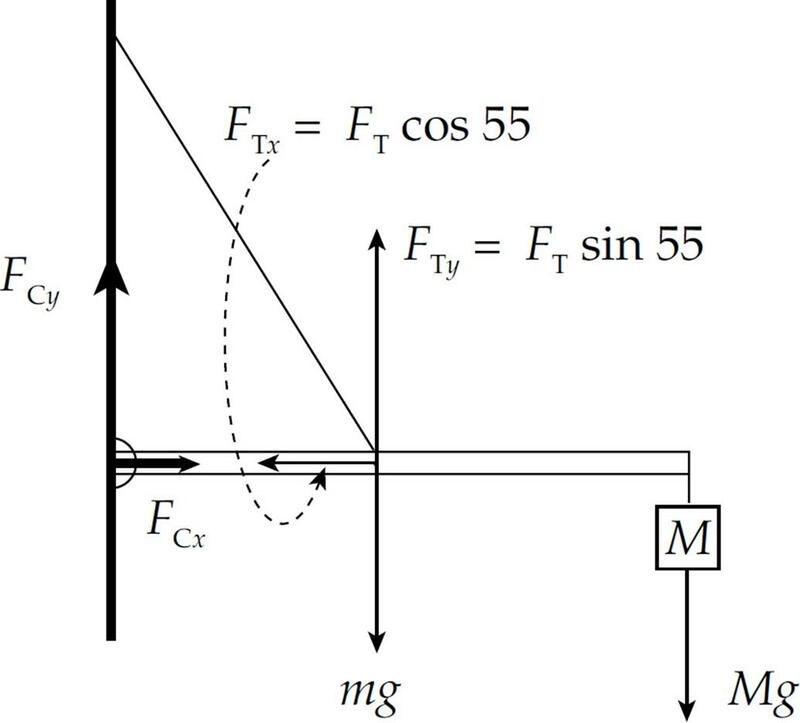 If the system is in static equilibrium, determine the tension in the wire and the strength of the force exerted on the bar by the wall if m = 8 kg and M = 12 kg. 1. A compact disc has a radius of 6 cm. If the disc rotates about its central axis at an angular speed of 5 rev/s, what is the linear speed of a point on the rim of the disc? 2. A compact disc has a radius of 6 cm. If the disc rotates about its central axis at a constant angular speed of 5 rev/s, what is the total distance traveled by a point on the rim of the disc in 40 min? 3. An object of mass 0.5 kg, moving in a circular path of radius 0.25 m, experiences a centripetal acceleration of constant magnitude 9 m/s2. What is the object’s angular speed? 4. An object, originally at rest, begins spinning under uniform angular acceleration. In 10 s, it completes an angular displacement of 60 rad. What is the numerical value of the angular acceleration? 5. In an effort to tighten a bolt, a force F is applied as shown in the figure above. If the distance from the end of the wrench to the center of the bolt is 20 cm and F = 20 N, what is the magnitude of the torque produced by F? 6. 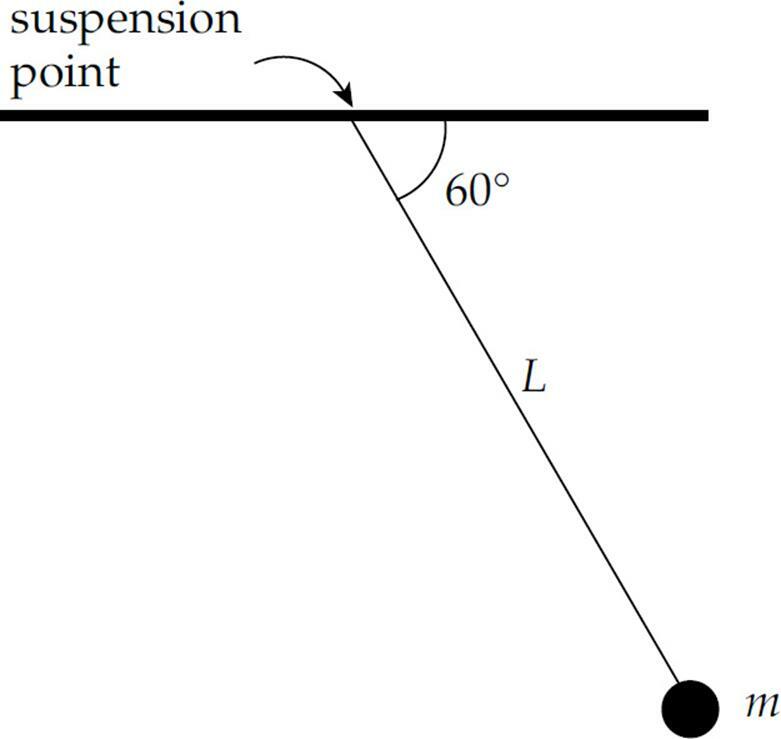 In the figure above, what is the torque about the pendulum’s suspension point produced by the weight of the bob, given that the length of the pendulum, L, is 80 cm and m = 0.50 kg? 7. A uniform meter stick of mass 1 kg is hanging from a thread attached at the stick’s midpoint. 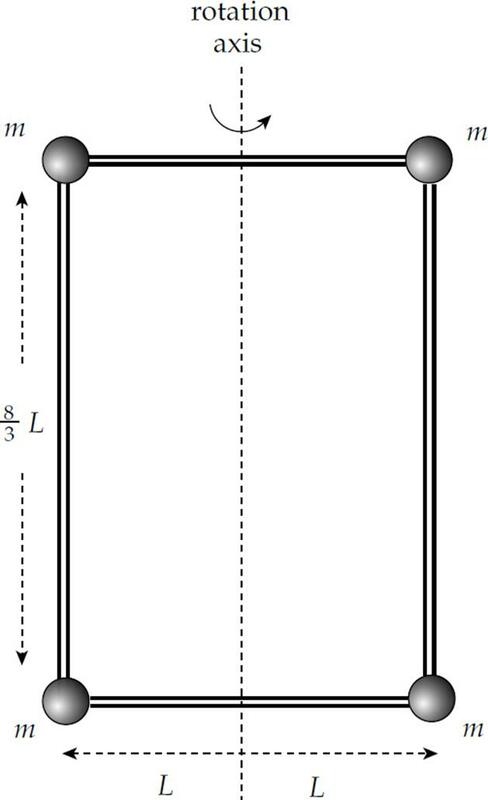 One block of mass m = 3 kg hangs from the left end of the stick, and another block, of unknown mass M, hangs below the 80 cm mark on the meter stick. 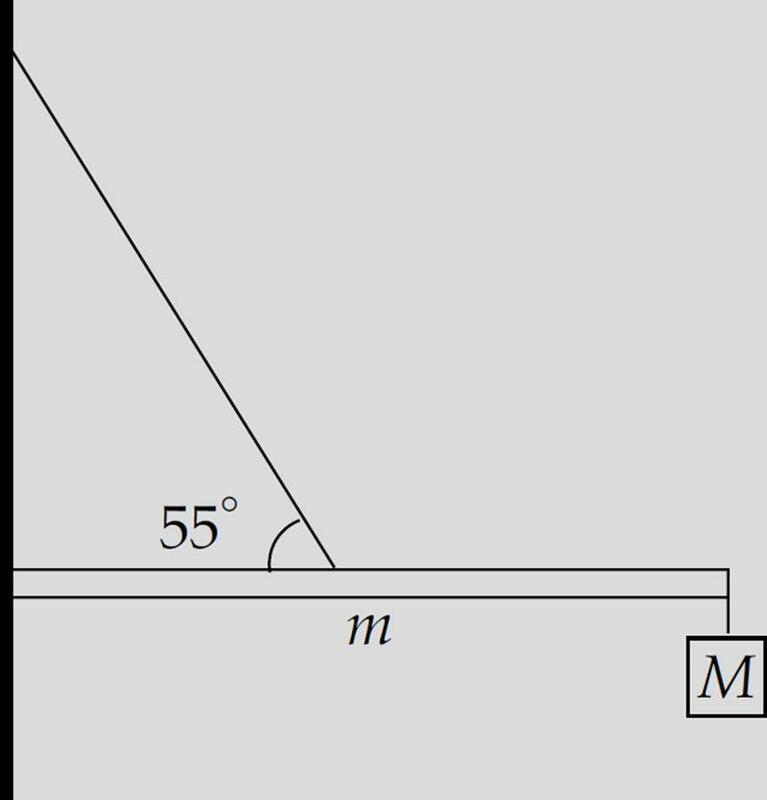 If the stick remains at rest in the horizontal position shown above, what is M? 9. 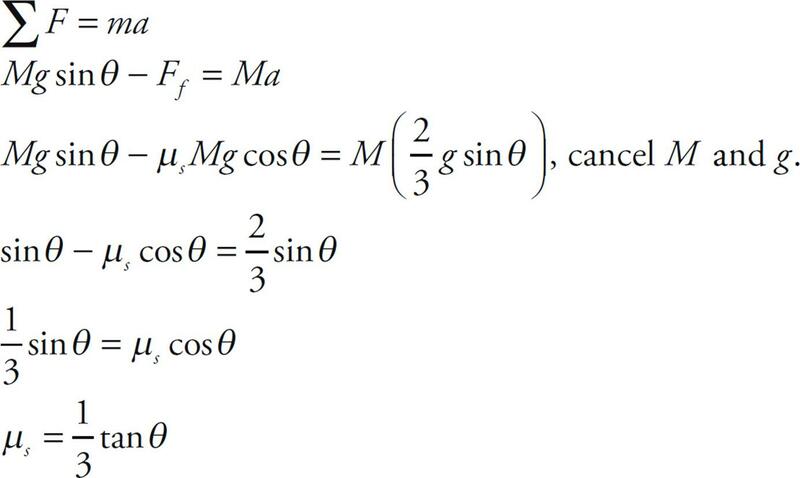 The moment of inertia of a solid uniform sphere of mass M and radius R is given by the equation I = MR2. Such a sphere is released from rest at the top of an inclined plane of height h, length L, and incline angle θ. If the sphere rolls without slipping, find its speed at the bottom of the incline. 10. An object spins with angular velocity ω. If the object’s moment of inertia increases by a factor of 2 without the application of an external torque, what will be the object’s new angular velocity? 1. 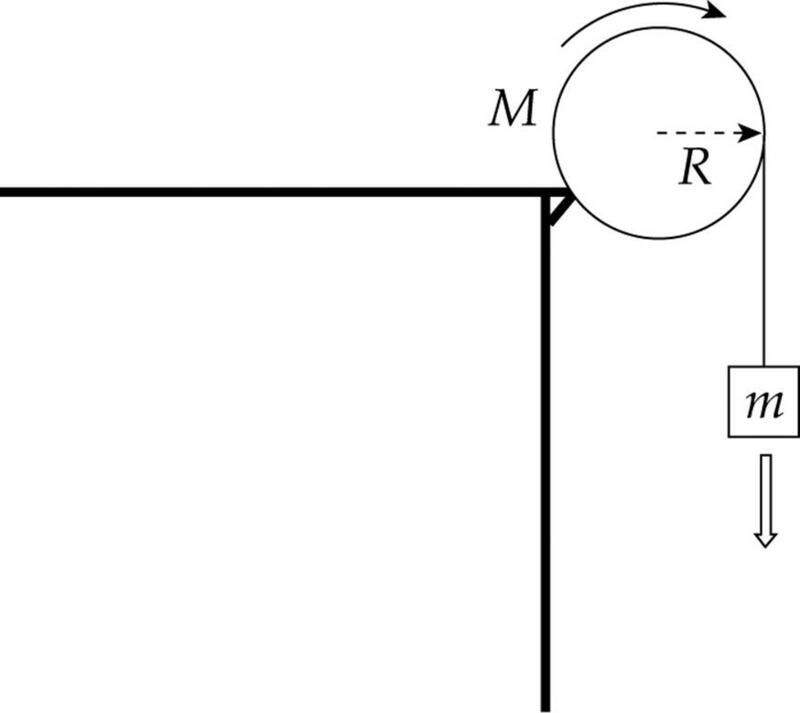 In the figure below, the pulley is a solid disk of mass M and radius R, with rotational inertia MR2/2. Two blocks, one of mass m1 and one of mass m2, hang from either side of the pulley by a light cord. Initially the system is at rest, with Block 1 on the floor and Block 2 held at height h above the floor. Block 2 is then released and allowed to fall. Give your answers in terms of m1, m2, M, R, h, and g.
(a) What is the speed of Block 2 just before it strikes the ground? (b) What is the angular speed of the pulley at this moment? (c) What’s the angular displacement of the pulley? (d) How long does it take for Block 2 to fall to the floor? 2. The diagram below shows a solid uniform cylinder of radius R and mass M rolling (without slipping) down an inclined plane of incline angle θ. 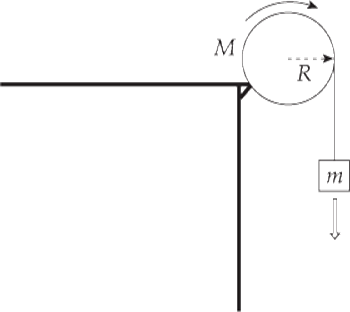 A thread wraps around the cylinder as it rolls down the plane and pulls upward on a block of mass m. Ignore the rotational inertia of the pulley. (a) Show that “rolling without slipping” means that the speed of the cylinder’s center of mass, vcm, is equal to Rω, where ω is its angular speed. (b) Show that, relative to P (the point of contact of the cylinder with the ramp), the speed of the top of the cylinder is 2vcm. (c) What is the relationship between the magnitude of the acceleration of the block and the linear acceleration of the cylinder? (d) What is the acceleration of the cylinder? (e) What is the acceleration of the block? 3. Two slender uniform bars, each of mass M and length 2L, meet at right angles at their midpoints to form a rigid assembly that’s able to rotate freely about an axis through the intersection point, perpendicular to the page. 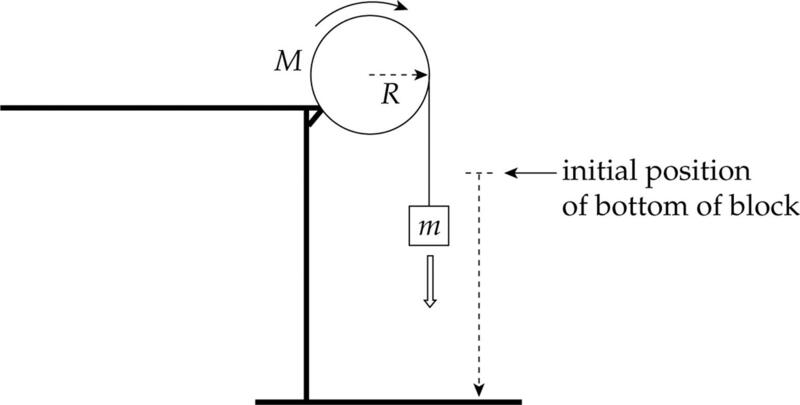 Attached to each end of each rod is a solid ball of clay of mass m. A bullet of mass mb is shot with velocity v as shown in the figure (which is a view from above of the assembly) and becomes embedded in the targeted clay ball. 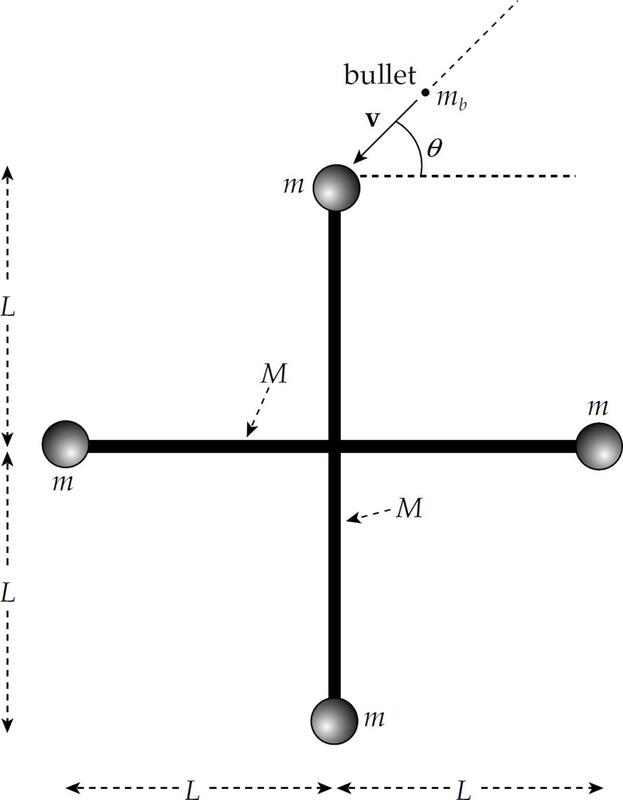 (a) Show that the moment of inertia of each slender rod about the given rotation axis, not including the clay balls, is ML2/3. (b) Determine the angular velocity of the assembly after the bullet has become lodged in the targeted clay ball. 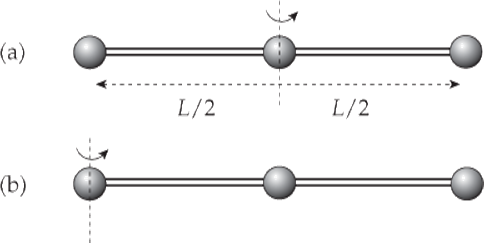 (c) What is the resulting linear speed of each clay ball? 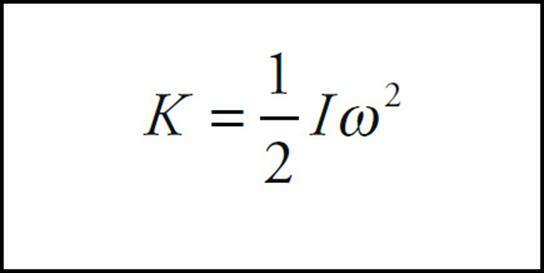 (d) Determine the ratio of the final kinetic energy of the assembly to the kinetic energy of the bullet before impact. Rotational inertia is the rotational analog of inertia, essentially a measure of how difficult it is to change an object’s rotational motion. 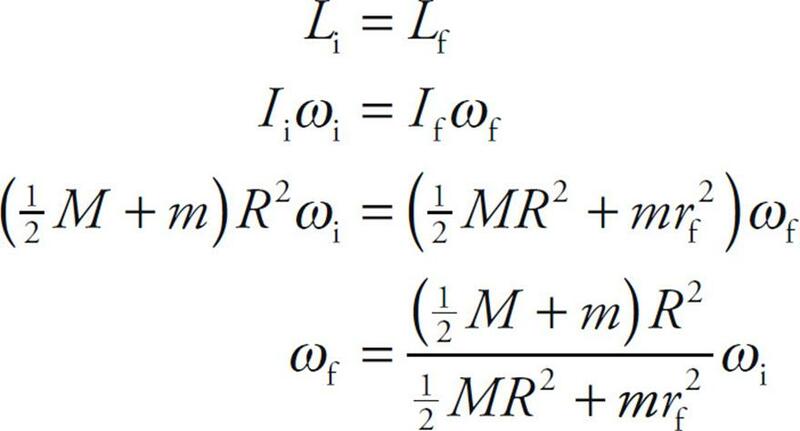 Angular momentum for a point particle is given by the equation L = Iω. Angular momentum for a rigid object is given by the equation . Angular momentum is conserved unless a net torque acts on the object. 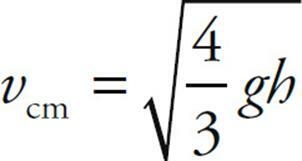 This is expressed by the equation Sτ = dL/dt. For an object to be in static equilibrium the net force and the net torque must be zero: ΣF = 0, Στ = 0.